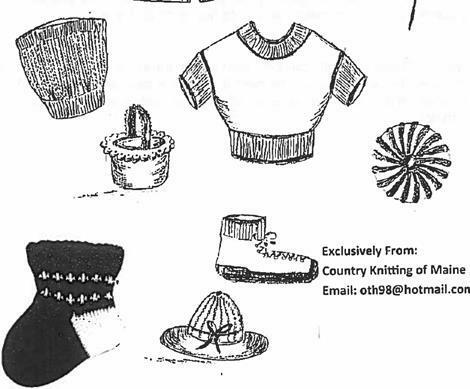 Country Knitting Of Maine Books Written by: June Timberlake. 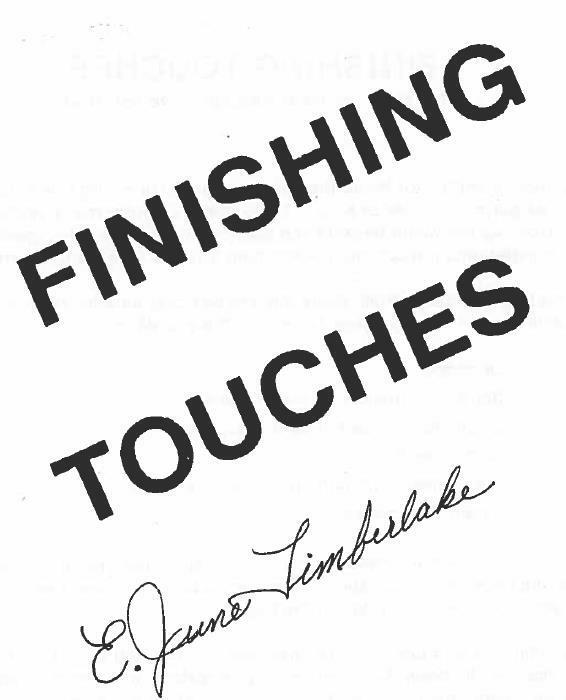 Copyrights purchased Oct. 2017. 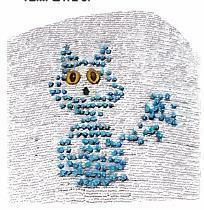 Retail $5.00 for pdf download. 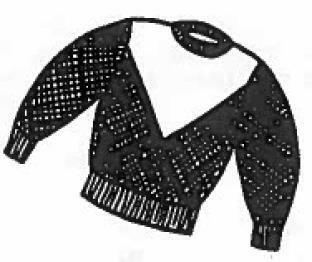 How to use one basic sweater pattern and create five different looks. 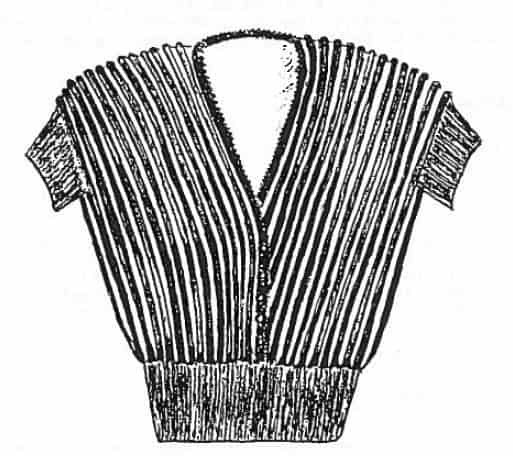 Includes various neckbands. Gauge of 7 sts & 10 rows = 1". 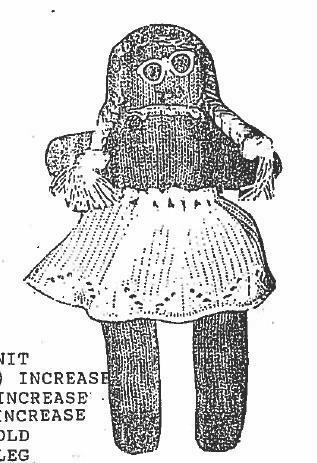 Yarn used was Tamm Diamanted or Rayito. 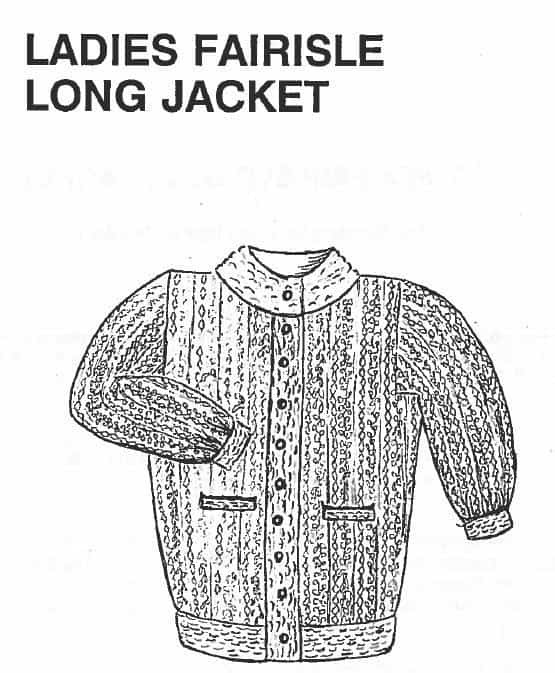 Gauge: 9 stitches & 12 rows = 2"
Easy to follow instructions for a comfortable car coat. 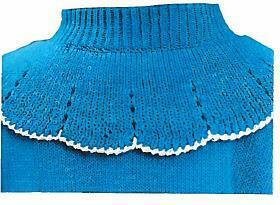 Knit on a bulky/chunky knitting machine with U.S. 4 ply yarn. 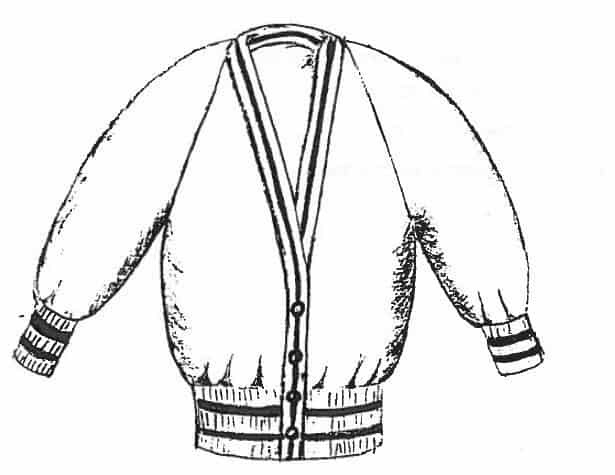 There are five variations for the front that each have their own instructions. gauge of 7 sts & 10 rows = 1". Sizes 2 through 12. yarn used was Tamm Diamanted or Rayito. 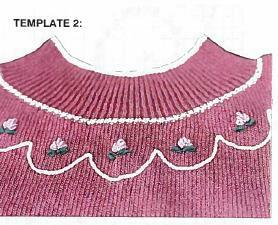 Use one basic sweater and create five different fronts. The Dammit Doll - Here is a dammit doll you shouldn't be without. For when the kids drive you up a wall or your husband makes you want to shout. Grab this doll and find a place to slam it all the while you yell Dammit, Dammit! They make cute kids dolls too. 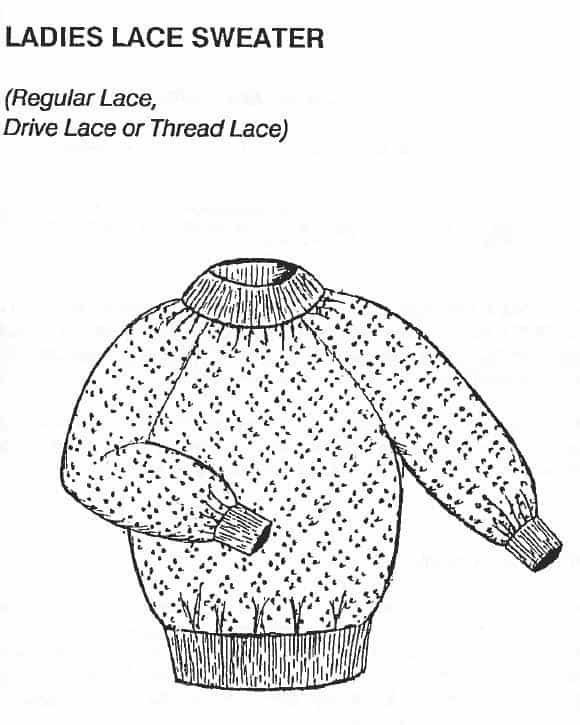 Easy to knit. Sample was made with 3 strands of 2/24 weight yarn. Gauge used 7 sts and 10 rows = 1". 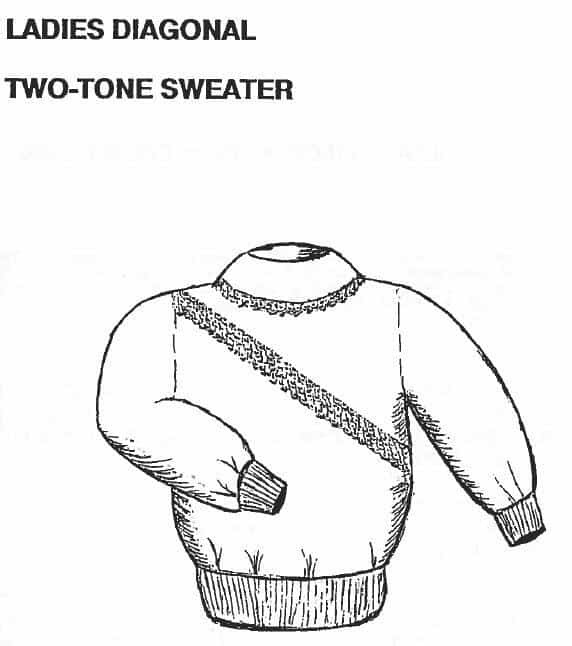 In this book they walk you through all the stages of obtaining a gauge as it is already given in a pattern to obtaining your own gauge and designing your own sweater. 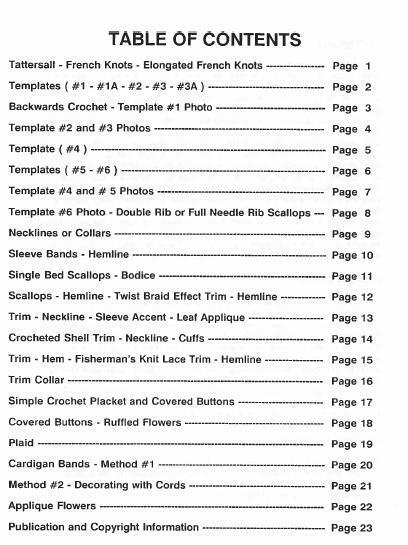 This is for the knitters that do not want to use a charting device. This gives you lessons to learn the process. 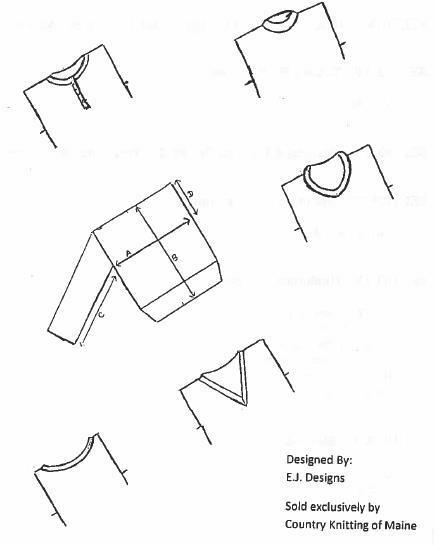 How to Obtain a gauge to match a pattern as written. 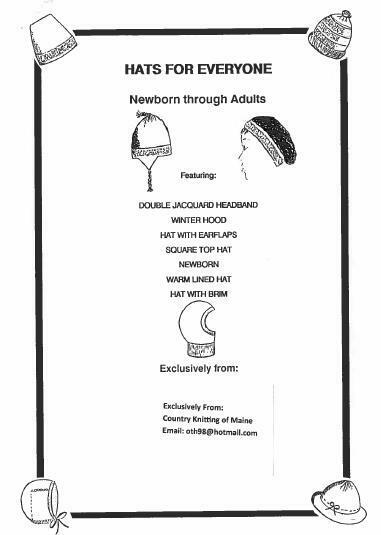 Newborn Sweater Set with Hat, Booties, Blanket and sweater. Gauge used 7 sts & 10 rows = 1". 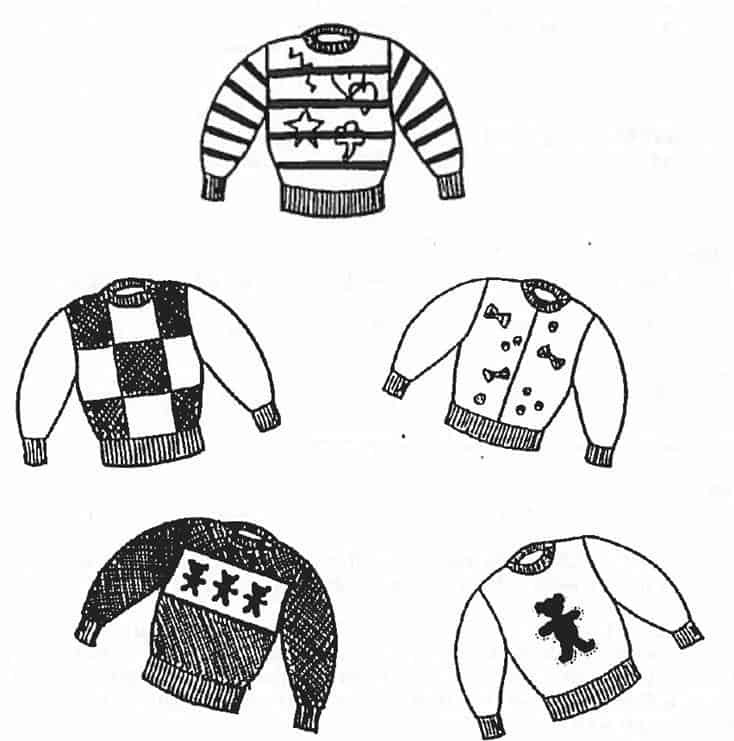 Sweater can be decorated in many ways. I used cables in the front panels by crossing 2 sts over 2 sts. 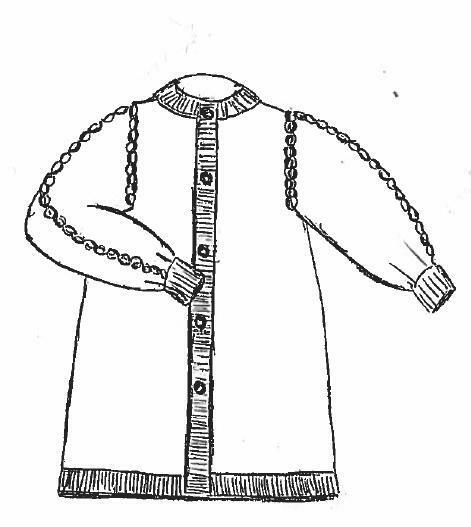 You can have the opening in the front or the back and can add a zipper for a back opening. 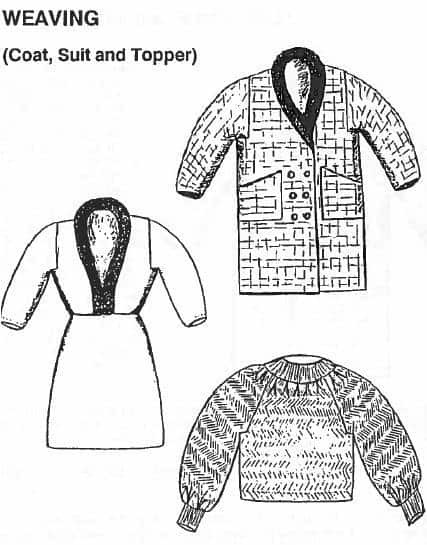 The afghan is knit in tuck and the tuck card pattern is included. Yarns suitable: Estillo, Can Cun, 3 strands of 2/24 or any yarn that meets the gauge of 7 sts & 10 rows =1". 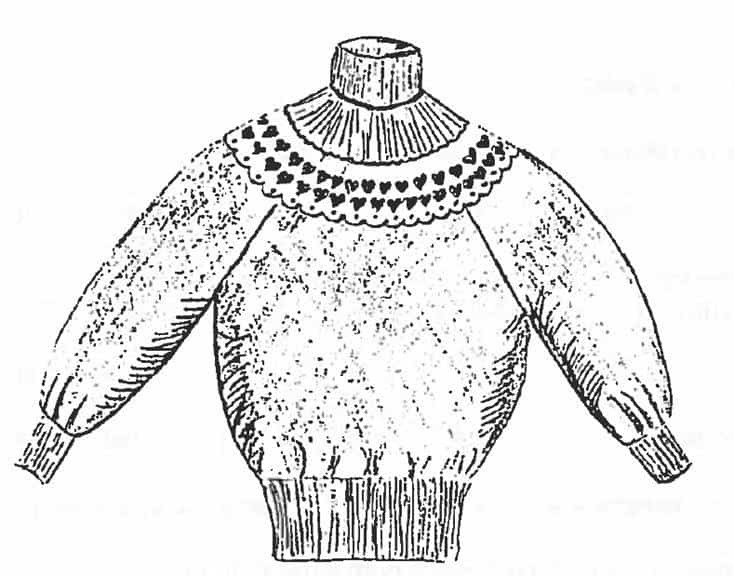 This sweater is knit the same for all sizes except for the shoulder sections. This is where the sizing is done. Yarns suitable: Rayito, Can Cun, Trenzi, 3 strands of 2/24 or any yarn that gives the gauge of: 6.5 sts & 11 rows =1"
Note from author: I have always loved the look of cables but disliked the tiresome job of crossing over stitches every few rows. After much experimenting, I found a simple way to make mock cables without crossing over. 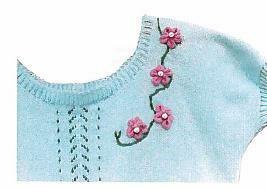 It is just a matter of needle set up and using your holding or partial knitting buttons. 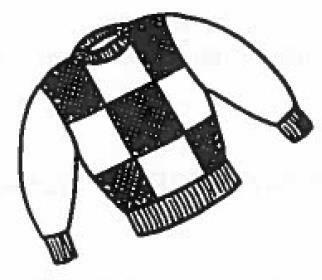 Yarns suitable are Can Cun, Rayito, Trenzi, or any 3 ply yarn that gives the gauge of 7 stitches and 10 rows =1"
Directions are given for a placket front, but you can easily change this to a crew neck if you desire. 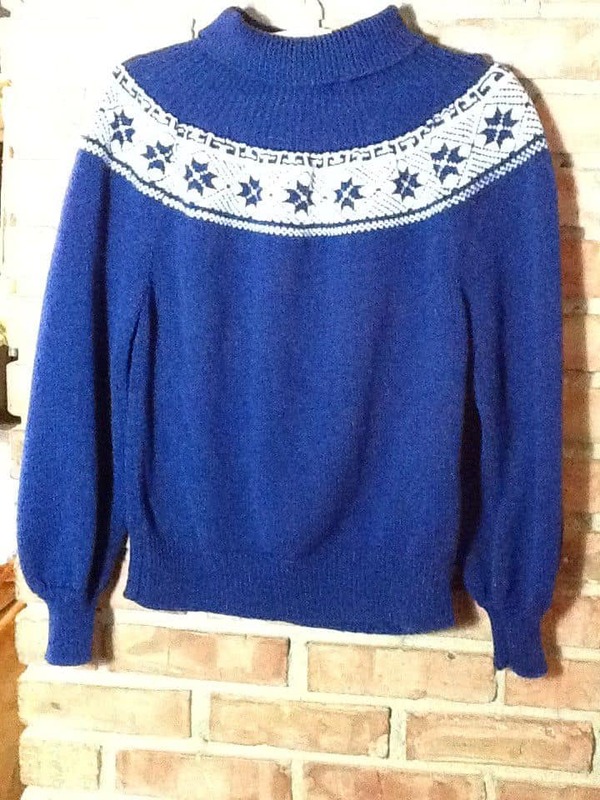 This sweater measures 32" long. These sweaters are meant to be loose and baggy and long. Three sizes include 43", 47" and 52". 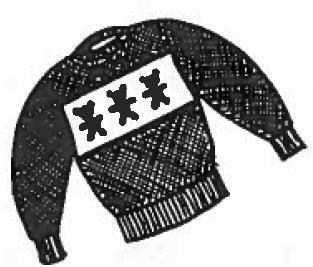 No Shape Yoke for Adults - We're pretty sure this sweater will become one of your all time favorites. 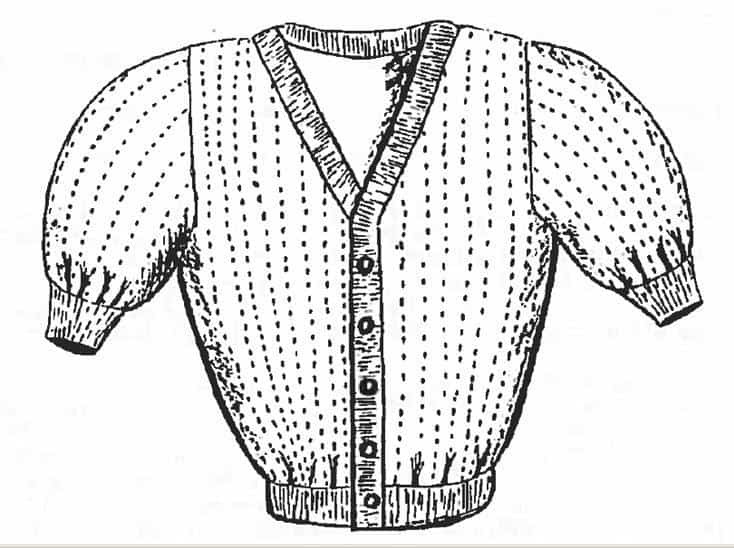 it offers you the beauty of a round yoke with the simplicity of a raglan. 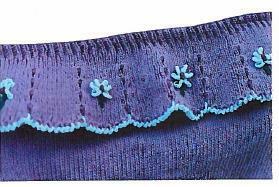 When we say NO SHAPING, we mean you won't have to remove it several times onto a garter bar to reduce stitches. 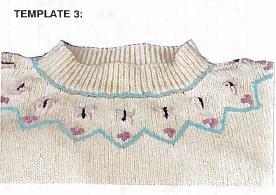 After the four main pieces are knit and removed on scrap yarn you rib the collar and the pieces are hung onto it. 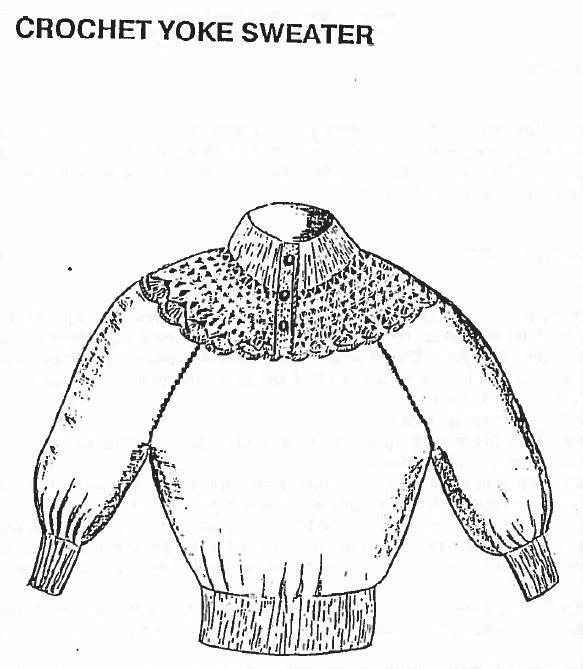 It's no more difficult then making a basic raglan but gives you the look of a round yoke. 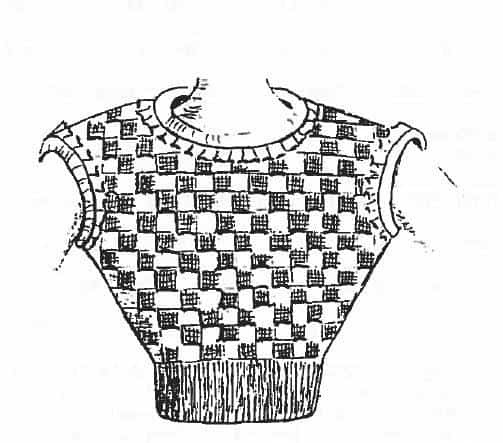 Instead of fairisle in the yoke section, you can try lace. Sizes: petite, small, medium, large and Xlarge. gauge of 7 sts and 10 rows = 1". 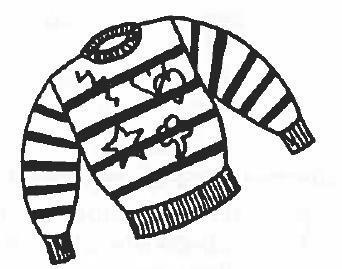 No Shape Yoke for Children - We're pretty sure this sweater will become one of your all time favorites. 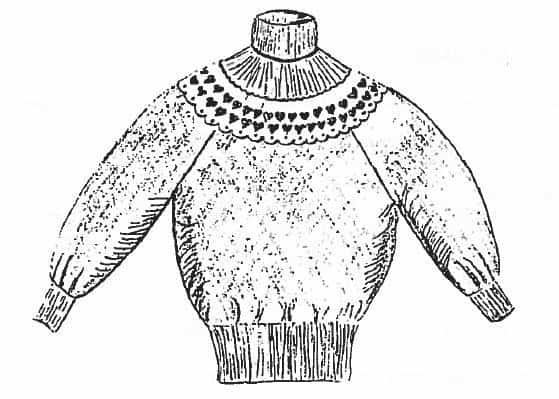 it offers you the beauty of a round yoke with the simplicity of a raglan. 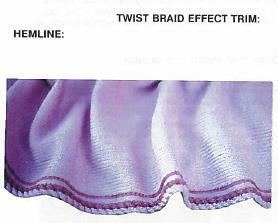 When we say NO SHAPING, we mean you won't have to remove it several times onto a garter bar to reduce stitches. 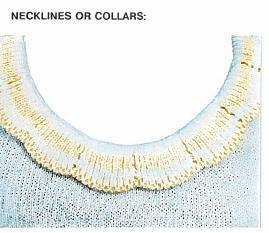 After the four main pieces are knit and removed on scrap yarn you rib the collar and the pieces are hung onto it. 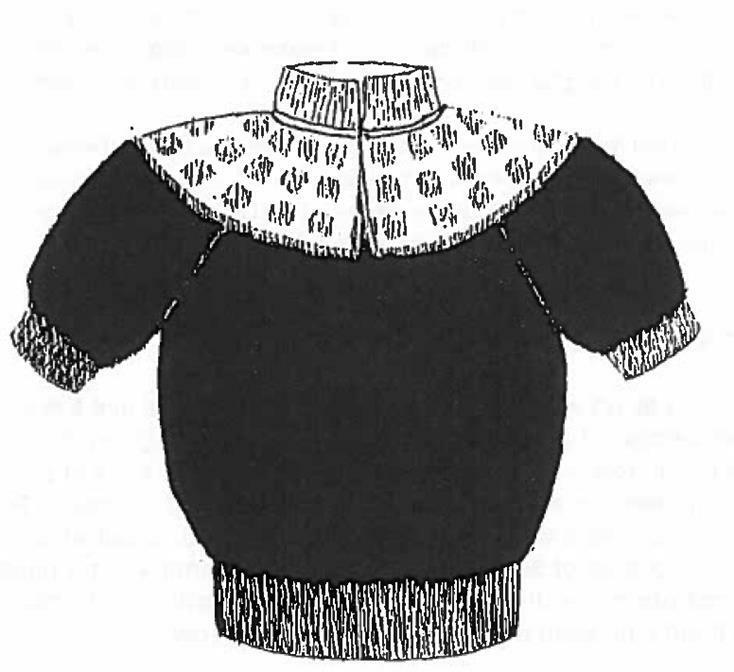 It's no more difficult then making a basic raglan but gives you the look of a round yoke. 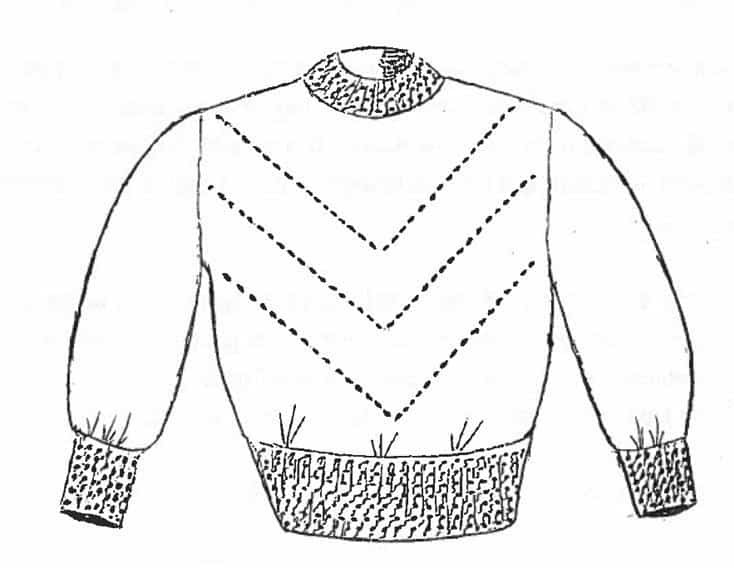 Instead of fairisle in the yoke section, you can try lace. Sizes: 2 through 12. gauge of 7 sts and 10 rows = 1"
Quick Crafty Projects - Many useful gifts and craft show ideas. 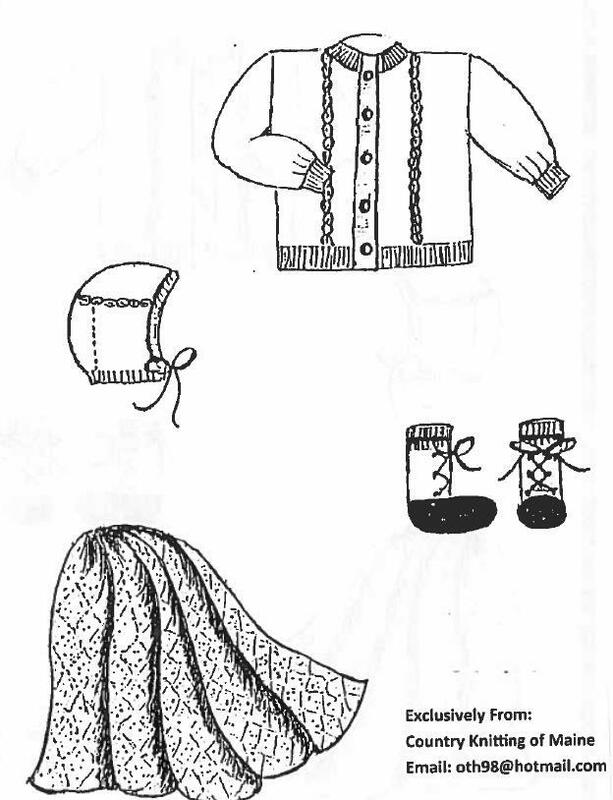 Patterns include: Triangle scarf with automatic fringe, two tone tennis slippers, decorative basket using butter container, fairisle headband with piquet edges, making beautiful carnation flowers, summer top to wear year round, shadow pleated pillow, new born changing/sleeping bag, turtle neck dickey, full fishermans rib shell, full needle rib place mats, plating wrap or cape, quickie slipper, racking hat and hard times Christmas stocking. 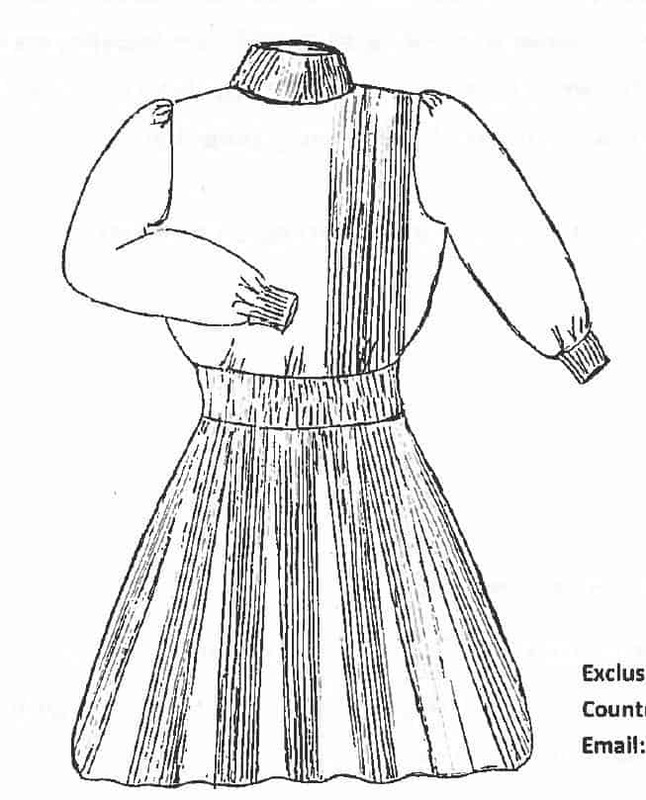 Standard gauge knitting machine. 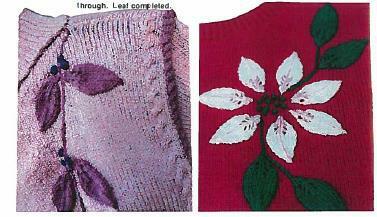 Each project lists suitable yarns. Shadow Pleated Vest and Long Sleeve Sweater - Shadow pleating is achieved by using a thick yarn for 6 rows and a thin yarn for 4 rows. Sample was made using 2/24 weight yarn The purl side is the right side. 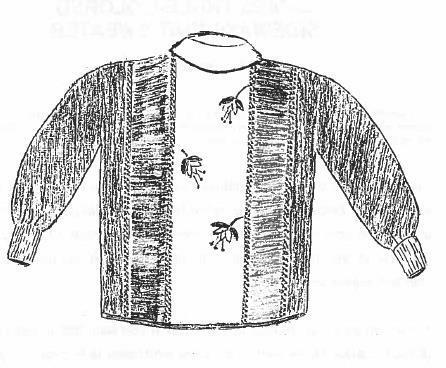 The prominent color will be the thicker yarn. 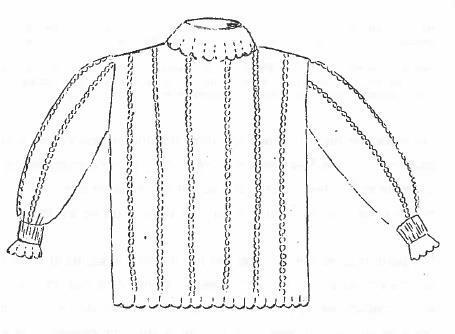 This has been designed to be one size fits all as it it knit sideways. It does have variations for short, average and tall people. Sideways Knit Cardigan and Tamm Knit in Tuck Stitch - This sweater is knit sideways which is flattering to all figure sizes. Using 2 rows of tuck every 20 rows creates a vertical stripe which has a slenderizing effect. This pattern has been written for short sleeves to create a layered look. 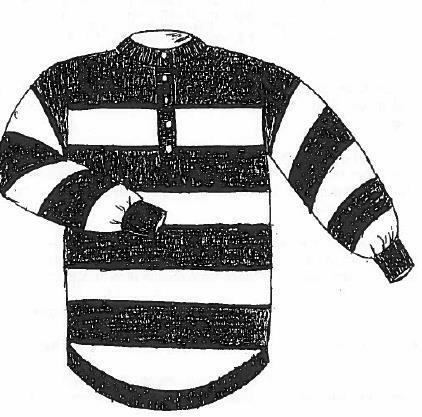 It could easily be made with long sleeves if desired. Finished bust sizes: 41, 15, 49 and 53. Gauge of 7 sts and 10 rows = 1". Sizes: small, medium, large and Xlarge. 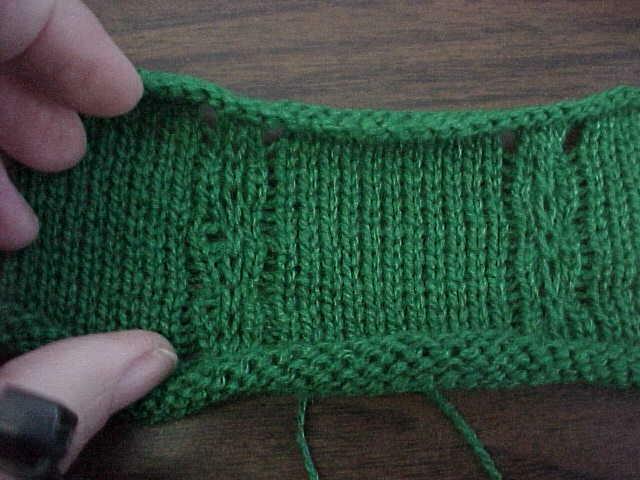 Gauge of 17 sts & 26 rows = 2"
Yarn used was Tamm Perla but any yarn that matches the gauge can be used. Easy to follow instructions. Includes short sleeve and long sleeve versions. Basket weave punch card design is included to copy onto your blank punch card. 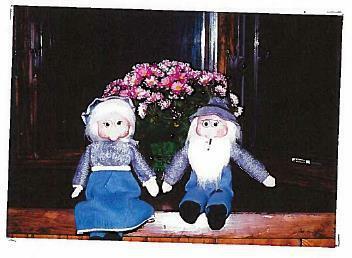 Grandma & Grandpa Dolls By June Timberlake of E.J. Designs. 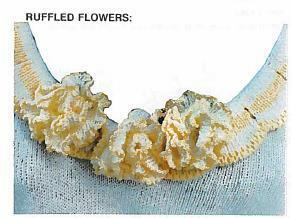 Yarns suitable for this project include Can Cun, Rayito, Trenzi or 3 strands of 2/24 or any yarn that meets the gauge of 7 sts & 10 rows = 1". 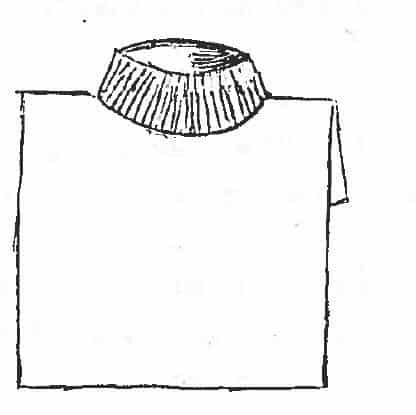 The body is a short piece of 2x4 which allows the doll to sit. you only need a 6" piece for each doll. 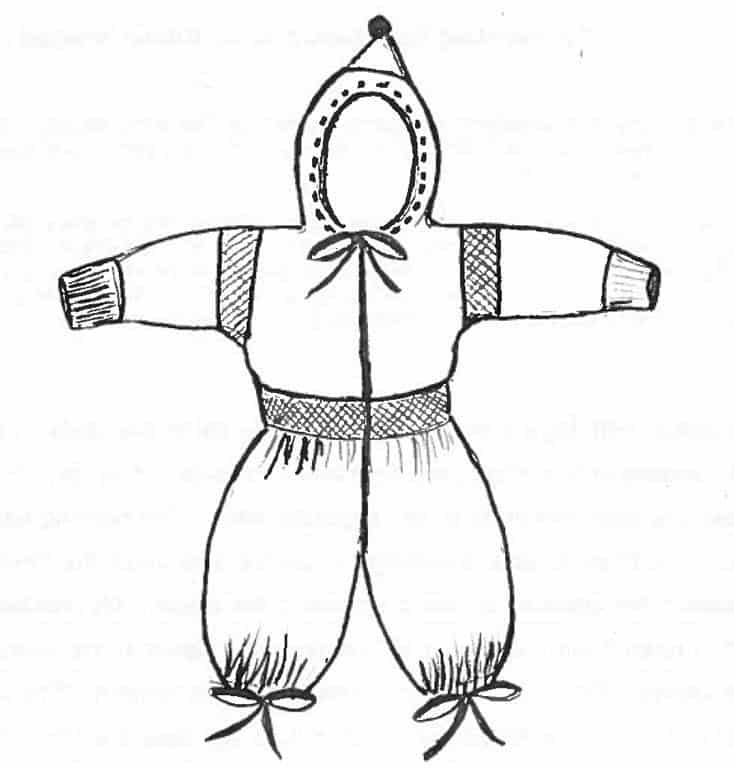 easy to knit and assemble. 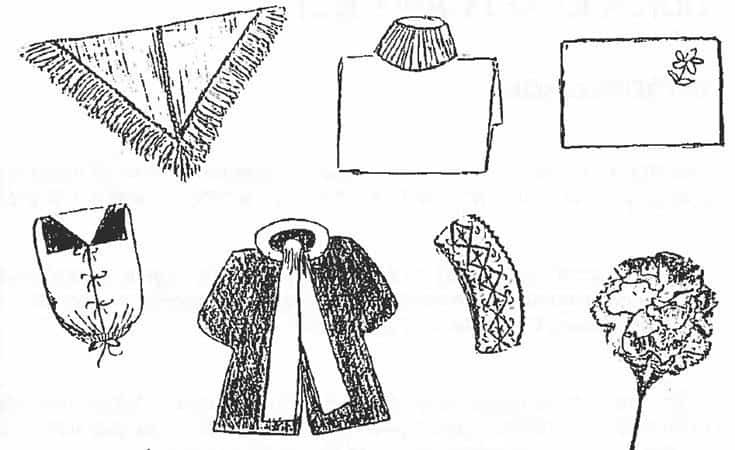 Weaving - Patterns for Coat, Suit and Topper. Gauge of 6 1/2 stitches and 11 rows = 1". 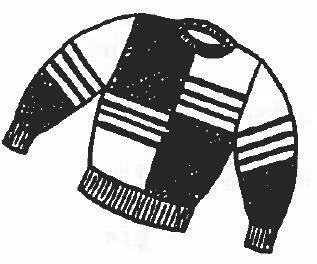 Women's or Men's Varsity Cardigan. Sizes Petite, Small, Medium, Large and Xlarge. 36" through 48"
Gauge: 7 stitches and 10 rows = 1".